This is plate 19 from James Fergusson's 'Illustrations of the Rock Cut Temples of India'. The 34 cave temples in Ellora date from approximately the sixth to the ninth centuries AD. They extend for more than two kilometres along the Chamadiri bluffs above the Deccan plains. 12 temples are Buddhist, 17 are Hindu, and 5 are Jain. That these three traditions could be seen together at one spot led to Fergusson's admiring description of Indian culture: "... her arts are more original and more varied, and her forms of civilisation present in an ever-changing variety, such as are nowhere else to be found." The Lankeshvara temple is one of the subsidiary shrines of the Kailasa complex. 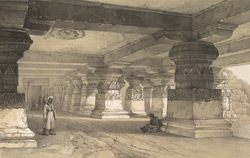 It was described in 1876 as follows: "Over the north colonnade is a very fine rock-cut temple, known as the Lanka Cave; over the south colonnade is another, called the Pir Lanka, and a bridge once communicated with it from the great hall of the Kailas, but this has been broken down, and the cave can not now be reached without a ladder."